FINDING: In many Mexican groceries, hardware stores in Mexican communities, well-stocked cookware stores and via the internet. CHOOSING: Cast-iron presses are heavier than aluminum ones and stay put better during pressing. Ones that have at least an 8-inch diameter offer more flexibility than smaller ones. Though some traditional cooks prefer wooden presses, they can be bulky and cumbersome for occasional use. USING: Corn tortillas are always pressed out between sheets of plastic. 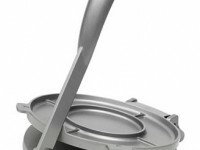 Tortilla presses cannot be used for flour tortillas.